The award-winning British-Turkish novelist will be discussing her remarkable writing and her intensely powerful new novel 10 Minutes 38 Seconds in this Strange World. 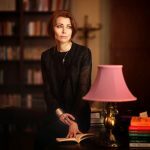 Elif Shafak is an advocate for women’s rights, LGBT rights and freedom of speech, an inspiring public speaker and twice a TED Global speaker, each time receiving a standing ovation. In 2017 she was chosen by Politico as one of the twelve people who would make the world better. She will be in conversation with Mathew Stadlen.